The Cardinals fell to Hamilton and Middlebury over the weekend, sinking their conference record to 1-4. New head coach Ben Somera had a quick start to his Wesleyan career, winning three of his first four matches with the Cardinals. Since then, however, the team has had very limited success. Two more losses last week dropped Wesleyan to a season-worst 4-7 record. In a week that marked the transition from the first half of the regular season to the second, Wesleyan had a chance to improve on its NESCAC record, with a home match against Hamilton on Friday and another in Middletown against Middlebury on Saturday. The match against Hamilton drew a large crowd, and it was not a letdown as far as entertainment value goes. The first set was controlled by long winning streaks by each side, including five straight Wesleyan points of services from Kelsey Tam ’19. 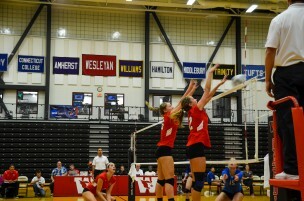 Wesleyan ultimately had the decisive run in a set that was tied, at latest, 14 apiece. The Cards pulled away with a 25-18 set win. The second set was less dramatic, as mistake-free play from the home team led to an easy 25-13 victory, putting Wesleyan in great position, up 2-0. In the third set, the script suddenly flipped. Hamilton played very steady volleyball, doing especially well at controlling their sets to create easier kill opportunities for their hitters. They raced out to an 18-12 lead, but could not hold on to momentum and eventually allowed Wesleyan to tie the set late at 22. Just as it seemed Wesleyan was ready to put the match away, however, the Continentals regained their form and took the set 25-23. With another chance to put the match away, the Cards started the fourth set well, taking an early 5-1 lead. The rest of the set was a back-and-forth affair in which Hamilton always seemed to hold on to momentum for slightly longer periods than Wesleyan. In the end, Hamilton was able to force the match into a final fifth set, with a close 25-22 victory. It was clear from the get-go that set five belonged to Hamilton. Wesleyan never held a lead, falling 15-7 in the set to complete the collapse and give Hamilton a 3-2 victory. Emma Robin ’19 and Tam each appeared in every set of the loss, something they had yet to do in their young careers. Sarah Swenson ’18 and Madeleine Lundberg ’19 continued their strong play on attack while Rachel Savage ’17 led the team with 30 digs. Somera was less than thrilled with the result of this match, but didn’t think the Cardinals had any one glaring issue that needed to be addressed. He also was able to pinpoint some of the reasons that the tide of the match swung so dramatically after the first two sets. Saturday’s match against 11-2 Middlebury was closely contested in every set. After Wesleyan raced out to a lead in the first set, Middlebury quickly took control and the lead en route to a 25-22 victory. This would turn out to be the closest set of the match, as the Panthers captured the last two sets by scores of 25-20 and 25-18. Though these sets were fairly competitive, the Cards were never able to truly take control of the flow of the match while Middlebury executed free-ball routines with ease. Many typical star contributors for Wesleyan had off games on Saturday. Swenson and Lundberg combined for a .000 hitting percentage, while setter Heidi Westerman ’17 fell well short of her usual assist tally, collecting just eight in her two sets of play. 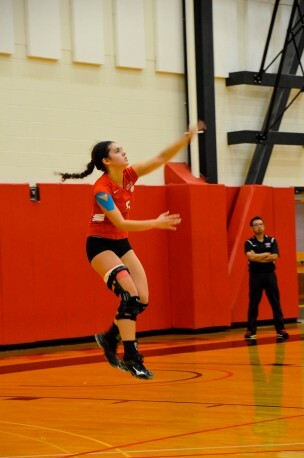 Robin had a solid all-around performance with a .429 hitting percentage and 4 blocks. Though the loss came in straight sets, Robin wasn’t totally negative about the team’s performance against Middlebury. These losses dropped the Cardinals to 1-4 against NESCAC opponents. The next seven matches will come on the road, and the next three will all be against NESCAC teams. Robin admitted that it can be difficult playing in a foreign environment. The team has just one match this week. It well be held at Bowdoin, who are 10-3 and have yet to lose to in NESCAC play.